I've been trying to get back to the basics, back to the A,B,Cs of what has worked for me in the past. Life has shifted gears these last several months. We became permanent residents of Puerto Rico. We moved into our new condo on the beach. We have been traveling. We have had a lot of company. 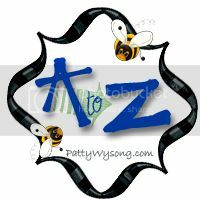 My sister's website and new A to Z challenge has reminded me to get back to the simple A,B,Cs in life. The Alphabet enables me to write. My writing is my therapy. There are times when I do not want my words to ever be read. I had wondered if not being able to reread some of my writings would bother me. It doesn't. I find that the simple process of writing with pen and paper clears my head and heart. It is the process, not the end result, that is important to me. I don't write like this all the time, just those times when I need to get the crud out without censor or concern. "A" - the first letter in the alphabet, a beginning, a step forward.